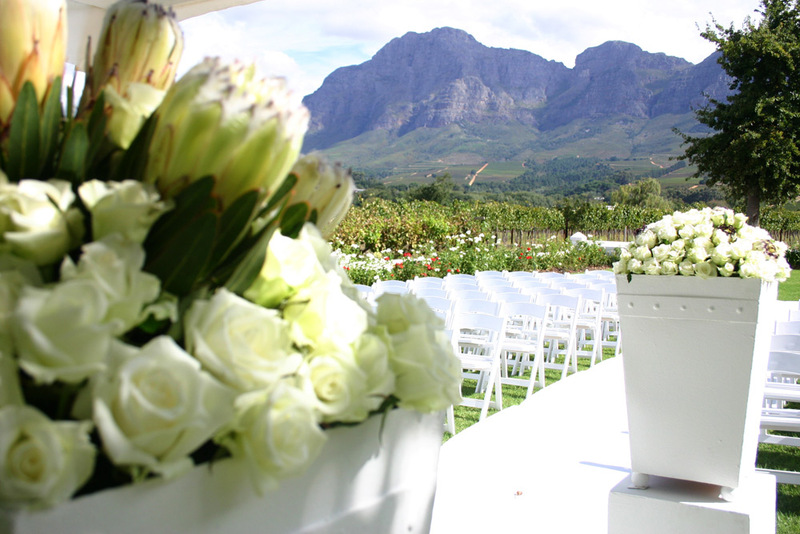 With the Historic Manor House from 1688 and the original wine cellar, Vrede en Lust in Franschhoek in the Cape Winelands offers a truly authentic experience for weddings and other special events. The Vineyard Terrace offers spectacular views over the vineyard and the Simonsberg in the Cape Winelands. The wedding venue at Vrede en Lust caters for up to 140 people seated or up to 200 people for cocktail wedding functions. A see-through tent wall, with waterproof lining is available in case poor weather threatens your function. A 6.5m long bar counter is built in with under-counter fridges and serving area. See more info at Vrede en Lust or contact Yolanda and Wiena direcly on +27 (0)21 874-1611 to get all the details for a wonderful wedding at Vrede en Lust.